Are We Listening Only to Ourselves? Are You Ready for a Capital Campaign? Are You Ready | Is It Feasible? Nonprofits and Boomers: Are We Missing the Boat? Google Fiber is a strong advocate for digital inclusion in Austin and across the nation. Here is my Instagram of a panel discussion held in May, 2017 at Google Fiber Space in downtown Austin. It is hard to imagine, but across the United States there are still many who have no idea how to use a computer. And while most people own mobile phones, access to wireless remains a constant challenge. I don’t know about you, but I am highly cognizant of how most job applications are only available online today. Not knowing how to use email, Microsoft Word and the Internet (or simply not to have ready access to a wireless “hot spot”), prevents some from applying for jobs, pays bills, submitting inquiries for essential information, completing medical forms and the like. Even if “computer skills” are not part of the job description, to apply for them one must have access to a computer of some type. Time sheets, product inventories and cash registers are all connected to complex corporate networks, and they require employees to be competent – at least in a basic fashion – with using technology. Sotun Krouch of Roca spoke about his nonprofit’s use of data during the Social Solutions 2017 Impact Summit in Austin. I was pleased to be invited to attend the Social Solutions 2017 Impact Summit in September in Austin. Here is a link to my Google Photo album. During the event, Robert F. Smith of Vista Equity Partners spoke with Kristin Nimsger, CEO of Social Solutions. Part of the discussion is found below in my Facebook Live video (3 minutes). Robert discusses the need for effective use of data, the increasing digitization of business globally, and how everyone is struggling to keep up! This is certainly true for those who find themselves in low income and underserved communities. I urge you to find the organizations in your community working to alleviate the “digital divide” and support them today. People of every generation and nation need to be included, and the time to start is now! Thanks to the Baltimore Sun for covering Texas Sealife Center in Corpus Christi, Texas (February 14, 2017). When Hurricane Harvey began to threaten the Texas Coast, one of my foremost concerns was its potential impact on Texas Sealife Center. I met founder Dr. Tim Tristan before I moved from Corpus Christi about seven years ago. He shared his vision of a veterinarian-driven wildlife rescue and rehabilitation center to aid shorebirds, raptors and sea turtles with me back then, and I have never forgotten. In 2011, Texas Sealife Center was established, and it has not looked back since. The Center is all-volunteer and it has been highly successful in helping animals caught in and injured by fishing lines, those that have ingested fishing lures, metal and plastic objects of all varieties, as well as those that have sustained physical injuries and contracted troublesome diseases. Tim and I have kept up remotely on Facebook. This summer, I agreed to help with some grant research and writing. The Center’s goal is to secure new equipment to support its medical and rehabilitation activities, with an emphasis on sea turtles. Sadly, the number of stranded and injured animals in the Coastal Bend of South Texas continues to increase. And, more sea turtles require help than ever before. Click to reach Texas Sealife Center’s Facebook page and more photos illustrating its work during Hurricane Harvey and more. As the volunteers have done time and again, they made themselves available 24-7 to aid wildlife caught in Hurricane Harvey and its aftermath. One of the Center’s primary partners is the ARK, or the Animal Rehabilitation Keep of the Marine Science Institute of The University of Texas at Austin, located further north on the Texas Coast. The ARK was heavily damaged during Hurricane Harvey, and Texas Sealife Center gladly took-in injured wildlife that could not be successfully released there. They continue to provide critical medical care and a safe haven until the animals can heal and be released into their natural habitats. Facebook became a powerful platform for conveying the work of Texas Sealife Center during this challenging time. Follow this link for information and powerful photographic documentation of its work. Aside from researching and submitting proposals for the Center’s urgent equipment needs, one of the most important things I did for this relatively young nonprofit was to create a meaningful GuideStar profile and to obtain the gold seal for transparency. Quite a few nonprofits with which I have worked fear they must have raised a lot of money and have well-known Board members, for instance, before establishing a full profile on GuideStar. But what GuideStar is about is not money as much as it is how transparent nonprofits are about their operations and programs, their tax statements, future plans and more. GuideStar is about trust and honesty. And hopefully, by taking the worthwhile step to secure the gold seal will inspire even greater confidence by prospective donors in the Center and its management, with the current capital campaign in mind. I have worked with nonprofit organizations large and small. Many of the larger ones have accomplished less than the smaller ones! Donors must be wary that a well-known “name” and a list of prominent Board members does not guarantee professional operations, efficiency, and genuine dedication by the leadership and staff. I have found small nonprofits and startups work exceedingly hard, and their volunteers are often more dedicated than those supporting organizations with ample budgets and long tenures. After a long career in major gift fundraising, some of my most fulfilling projects have involved helping small groups build the credibility necessary to inspire significant donations. With this in mind, I urge you to support Texas Sealife Center, and please follow its progress on Facebook. Thank you! You might enjoy reading my LinkedIn blog post from 2014, #2030NOW, which addresses startups and innovative young nonprofit concepts, and my hope more “Boomers” will fund them. Did you know? You can donate to Texas Sealife Center directly from its GuideStar profile. I have wanted to discuss this topic for a long time, but I have struggled with how best to go about it. I have not known a nonprofit support organization to tackle this topic in a realistic way, yet it is especially important for new staff, especially those in development. I do think some acknowledgement by leaders in our sector would be helpful, as would developing some “mindset” training into our industry’s regular regimen of educational conferences. When I obtained my first nonprofit position, I bonded with the organization, its image and mission totally. To my mind, we were inseparably linked. The two did not exist apart from one another! I was young, learning at a fast pace, and I absolutely loved the organization. It felt like a perfect fit. Now, it is true that some of those same philanthropists are friends and professional colleagues today, more than twenty five years later. But the pain of leaving my first nonprofit family and friends was hard. But something important happened. I underwent a crucial mental change. I looked ahead, recognizing that it was entirely possible I would interact with my former nonprofit donors in future jobs. Those realizations marked a significant change in attitude and helped me succeed in my future positions. The moment this shift occurred, it became possible for me to be friends with many of the philanthropists with whom I worked over the years in the sense we became comfortable talking about philanthropy more broadly, we shared general advice and personal life experiences. Mutual respect had been established. “Letting go” was a mature step forward that I needed to take. Which is to say, nonprofit development professionals are not the sole spokespersons for the organizations with which they work. Directors, program officers, curators and even groundskeepers have their own relationships. Regrettably, I have experienced intense jealousy by other staff members when they see how comfortable I am with donors. Some have attempted to get rid of me entirely, feeling there is too much competition! But in truth, I have mentally separated myself in such a way that I fully understand the nonprofit with which I am currently working will go on long after I am gone. If I can make appropriate connections to benefit the project at hand, I definitely will. But I do not “own” any donor. The decision to become involved and to donate is entirely theirs. Some staff can see you as a threat to their own (self) appointed position as, “the best friend of the donor.” I have discovered this with executive directors and department heads, for example. But I urge you, regardless and for your own well being, separate yourself from the organization mentally. You have your own life and are a person of value without or without the nonprofit. Represent your organization in an absolutely first class fashion 24-7, even when you are not working. But also, step out of the picture if you become uncomfortable. I have discovered donors and volunteers (and the nonprofit organization) will appreciate you more if you follow this advice, and you will earn their trust for a lifetime. Nonprofit work can inspire a stronger emotional attachment psychologically than corporate work, at least in my experience. This is especially true with those new to the nonprofit sector and in my case, with younger, inexperienced staff members. The organization’s leadership should be mindful of this dimension of their work and be sensitive to it. Today, employees change jobs fairly frequently and if you can part ways in a civil fashion, giving the less experienced staff a positive boost as they march out the door, everyone will be better off. That can be a tough assignment, but I believe it is a worthy one. The Donor Relations Guru has posted a thoughtful article I enjoyed, “Team Player or Individual Contributor?” (April, 2017). I admit, I like the point of view conveyed. “They say in fundraising there’s an 80/20 rule, that 80% of the money comes from 20% of the donors. I have my own 80/20 rule for working and implementation and its one that may strike home for you too. 80 percent of the work gets done by 20 percent of the employees.” I have been hired a few times to do work the staff either tried to do and failed, or refused to do at all. I have also been hired to achieve “the impossible,” only to have other staff take my laurels when I am done with my work. I sometimes say in my mind, “if you could have done the job without me, why didn’t you?” I often wonder why these kinds of employees retain their jobs, but they always seem to. Founder’s Syndrome is something I have encountered occasionally in my work over the years. Here is an article by Jeff Jowdy for NonProfitPRO (2013), “9 Ways for Nonprofits to Overcome ‘Founder’s Syndrome’.” Founder’s Syndrome is a bit more dangerous phenomenon than youthful attachment to an organization. “Founder’s Syndrome can be particularly devastating to fundraising. If a founder is not open to increased accountability as an organization grows, donors will become increasingly suspicious and may eventually flee.” This is where my personal “rub” has occurred in the past, when an Executive Director becomes threatened and unnecessarily jealous of my contacts and fundraising success. I have learned to step back, and if a resolution cannot be reached – despite my being the primary tie to the donors – I have removed myself from the situation. And a few times, the donors have gotten upset with me. But truly, I had no choice. You might enjoy reading Oliver Burkeman for The Guardian, “Beware the Gravitational Pull of Mediocrity” (2015). Sometimes when people strive for excellence, organizational strife can result. Innovators can be viewed as dangerous! And sometimes, the one achieving excellence can be seen as a threat, and they may ultimately be pushed out. I have also seen mediocre employees remain on staff at nonprofit organizations, and for decades. They are neither terrible at their jobs, nor excellent. Go figure. Personally, I think mediocrity is an underappreciated survival skill. Jennifer Verdolin Ph.D. wrote for Psychology Today, “Is It Only Natural for Us to Be Jealous?” (2014). “We humans not only have the tendency to become jealous over imagined threats, we also don’t often seem to take into account the ‘cost’ of certain behaviors.” I think educational programming for development professionals on dealing with jealousy would be an excellent idea. Mike Hogan of the ONE Texas office and I were pleased to deliver a petition in favor of The Electrify Africa Act to Blaine Fulmer, formerly of U.S. Congressman Michael T. McCaul’s office in Austin a few years ago. Thanks to everyone who signed it! I became an advocate for ONE Campaign when living in San Antonio, Texas ca. 2012. I carried that interest with me when I returned to Austin in mid-2013. I have enjoyed working with the Texas staff representative for ONE. My first few years living and working in Austin were in District 10; I now live in District 21 on the western edge of Austin in the Texas Hill Country. Mike Hogan is shown at left with ONE colleagues while conducting a “Strengthie” photo campaign at Stouthaus Coffee Pub in South Austin. After many years of intense major gift fundraising work with a number of worthy nonprofit projects across the state of Texas, the economic downturn allowed me “quiet time” to return to some of my other life interests. From my young days in grade school I was fascinated by Africa and the Middle East. I watched television programs about them, and voraciously read Time Life books my parents had acquired for my edification, over and over again. Then, when I was in high school, my parents paid for a month-long family trip to the Middle East and North Africa, where my interests were deepened even further. “ONE is a campaigning and advocacy organization of more than seven million people around the world taking action to end extreme poverty and preventable disease, particularly in Africa. We believe the fight against poverty isn’t about charity, but about justice and equality. Why should someone like me support critical needs like electricity for Africa? I believe Africa represents the future of our world. It has so much promise on every level! But also, allowing horrible living conditions, dire poverty, disease and ignorance to persist means many issues here at home like national security are negatively impacted. Problems overseas can quickly become our own problems, as we have seen time and time again. With relatively little expense, these international challenges can be alleviated for the benefit of the entire human race. And as a former member of the Board of IREC: Interstate Renewable Energy Council, I am particularly devoted to clean energy, not only across the United States, but globally. “In sub-Saharan Africa, more than 620 million people do not have access to electricity. Thirty seven countries in sub-Saharan Africa have a national electrification rate of below 50 percent. These endemic power shortages affect all aspects of life. The President and Congress are working with African leaders, civil society organizations, and the private sector to dramatically change this dire situation. We know energy access is one of the most urgent priorities for people in sub-Saharan Africa with one in five Africans citing infrastructure – including electricity – as their most pressing concern. Clearly, the world must support African leaders as they work to improve this dire situation. When I first went off to college to The University of Texas at Austin in the 1970s, I was fortunate to study African literature with Dr. Bernth Lindfors. You might enjoy reading about Dr. Lindfors in this outstanding online journal, “Life and Letters: The One And Only Bernth Lindfors” (page 6). That is exactly what African literature did for me. You might consider African authors the next time you are seeking a good book to read. Follow the link to Goodreads to find more impressive books and authors. Support ONE Campaign today and help release millions of Africans from the grip of extreme poverty. It costs you nothing but your voice. The trip abroad mentioned in this post was organized by the Houston division of Neiman Marcus, many years ago when I was still in high school. It was the trip of a lifetime, and I continue to thank my father for it. I “grew up” during that month-long expedition. We saw both glorious monuments and the most shocking poverty imaginable (life outside the suburbs of Houston is not what I expected). I needed that. In 2018, I undertook a DNA test with Ancestry.com. Our family has long suspected we have African roots through my mother’s side. That turned out to be true with 1% of my DNA being from Cameroon and the Congo! I was thrilled, and we were glad to have the mystery of our darker skin resolved. Now, I am an even greater advocate for ONE Campaign, and I am exploring that 1% online as often as I can. High school portrait by a former boyfriend (from the 1970s). I was always pegged as Hispanic from my earliest grade school days through college. Today, I am growing my gray hair out and being averse to sunburn (after decades of poolside tanning in my youth), my skin has lightened up. I enjoyed seeing the movie, Black Panther, and being a local tech club volunteer involved with NTEN: Nonprofit Technology Network and NetSquared (a division of TechSoup), my DNA results and my natural tech inclination makes some sense, smiles. I am from Wakanda. Click to read about the Austin Powwow and American Indian Heritage Festival. Attending the 24th Annual Austin Powwow in November, 2015 was an amazing experience. I was excited to learn about the organization, Great Promise for American Indians. The mission of Great Promise for American Indians is to preserve the traditions, heritage and culture of American Indians, and to support the health and education needs of their youth and families. We do this to honor the past, and to ensure the future. I urge you to review the website and consider supporting Great Promise! Follow this link to see Carolyn’s Tumblr and my photo essay about the Powwow (which also includes a few Instagram video links). The mission statement above brings to mind a concept I hold true in my own profession: nonprofit fundraising professionals should both honor the past – traditional, proven methods of educating, cultivating, soliciting and stewarding relationships with donors – while also adopting new methods. In this way, we will ensure a sustainable future for the nonprofit organizations we support. The iPhone photograph above features a striking Indian in colorful formal dress using a mobile phone to photograph the traditional dances taking place on the floor below. He summarizes well the theme of this post! npENGAGE noted in, “5 Ways Technology Will Shape the Nonprofit Sector” back in 2014 (and still true today), “Think back even five years ago, ten years ago – how different is the nonprofit landscape now compared to then? It’s pretty dramatic.” Follow the link to read about the five trends: mobile, analytics, software, cloud and social media. One of my earliest posts focuses on using “high tech” research methods to identify major gift prospects. I consider those methods to be invaluable. I have seen firsthand how major gift campaigns that at first appeared to lack an adequate number of prospective donors, suddenly have a dearth of them once proper research was conducted. The best of both worlds when it comes to major gift fundraising includes detailed research and analysis using the latest technologies, combined with traditional methods of education, cultivation, solicitation and stewardship, all with genuine caring and thoughtfulness on the part of the development professionals involved. But the nonprofit sector still has work to do when it comes to marrying traditional and modern approaches to fundraising and communication. Nonprofits generally fail to engage current and potential donors using social media, for instance. One of the prevailing themes of Carolyn’s Nonprofit Blog is that high net worth households own more digital devices than the general population, and they are highly active on social media. They conduct business and spend their leisure time using a variety of convenient mobile devices. It makes sense for nonprofits to use these tools to communicate with and engage those capable of making significant charitable donations. Follow this link to learn about the specific demographics of American smartphone ownership, cell phone, tablets, laptops and more. Some fundraising professionals remain focused entirely on less modern methods in major gift fundraising. And, I have taken the “heat” for my blended approach on more than one occasion. But the fundraising profession is changing. My discovery is simply this: one person can accomplish a great deal when armed with the proper technology, software, and positive mental attitude. Sometimes one person can accomplish as much or more than several major gift professionals and/or consultants. This is a trend worth watching, and a situation of not only adapting to change, but embracing it for a more sustainable, efficient and effective future. Click to reach ethical fundraising resources from the National Council of Nonprofits. But after many years working in the trenches of nonprofit fundraising, I believe a Nonprofit Fundraisers’ Bill of Rights is also in order. I. To be informed of the organization’s mission, of the way the organization intends to use donated resources, and of its capacity to use donations effectively for their intended purposes. Nonprofit development staff are sometimes asked to solicit donations but over time, they may discover the funds they solicited are not being used as originally discussed. The nonprofit may be unable to effectively carry out the project as intended. Development staff can be tremendous allies in this situation. They should be informed and given the opportunity to translate changes to the donors they solicited, thereby ensuring an honest relationship and retaining personal, professional and organizational integrity. Sometimes nonprofit organizations fear a negative reaction from donors if a change of direction with an important project is necessary. But I have found if changes and challenges are aired in a forthright manner, donors appreciate the candor and often continue to give more. II. To be informed of the identity of those serving on the organization’s governing board, and to expect the board to exercise prudent judgment in its stewardship responsibilities. This is good protection for fundraising professionals as well. Development professionals need to be able to learn about, meet and interact with those serving on the Board in order to function properly in their jobs. But sometimes senior executives prevent interaction between development professionals and staff and Board members. This is a mistake. Most Board members welcome the advice and support of development staff. If they do not interact, problems may ensue. Development professionals are donor advocates and allies. When allowed to do their job properly, the better the reputation of the nonprofit, its Board, and each and every donor with whom they work. I once heard a foundation staff member arrogantly proclaim they would only be “friends” with donors, not “development officers,” as if being a development officer is a lowly office. Beware: oftentimes the development officer is one of the most knowledgeable staff members at the nonprofit organization, one who cares about the organization’s donors the most. They will fight for you if you allow them to do so. III. To have access to the organization’s most recent financial statements. Not only should nonprofit development staff have access to Form 990s – which today one can find readily on GuideStar – they should be encouraged to review those financial documents and to become knowledgeable about them. As donors and professional advisors become more savvy (and discerning), being armed with this knowledge is essential to functioning properly on the job. I have a case study on GuideStar that addresses this very topic. IV. To be assured their gifts will be used for the purposes for which they were given. Similar to the first tenet discussed, development staff should be informed if a donation is not being used for its intended purpose. Sometimes, program staff and others in positions of leadership fail to share changes with the development department. Nonprofit fundraisers should be given the opportunity to discuss any changes in terms of the project(s) funded with the donor(s) they solicited originally. V. To receive appropriate acknowledgement and recognition. Once a grant or gift has been awarded, and if the donor does not require anonymity, then appropriate recognition should be given in project materials and organizational publications (online and hard copy). Verbal recognition and acknowledgement on social media can also be meaningful. Those of us in the nonprofit sector know it is often the case that volunteers help open doors and solicit gifts from individuals, families, foundations, corporations and government agencies. They deserve recognition and thanks for their efforts. But sometimes it a fundraising professional on staff who has conducted the research necessary to identify donors, and they are the one who has made the all-important introduction, and secured the gift. VI. To be assured that information about donations are handled with respect and with confidentiality to the extent provided by law. Sometimes development staff are not kept in the “loop” when donations are announced by organizational representatives verbally, online or in print. Fundraising staff must guide the announcement process and help the nonprofit they represent maintain the wishes of each donor regarding confidentiality, proper name spelling, announcement timing and the like. Sometimes, marketing and public information specialists chafe when partnering with development staff. I have noted one concern is they perceive their work to be “pure” – they seek to represent the institution factually to the public and to the media, and they do not wish to be “tainted” by discussing donors. But nonprofits survive by securing charitable donations, and these two staff functions must work together harmoniously. VII. To expect that all relationships with individuals representing organizations of interest to the donor will be professional in nature. This tenet is also true for nonprofit fundraisers. Development staff should not feel that in order to cultivate a donor relationship they must run personal errands for donors, become a personal driver or shopper, or conduct other business unrelated to the nonprofit organization and its mission. Should a donor or prospect become verbally abusive or make improper advances, development staff should be encouraged to report such activity to their superiors, and they should expect to be protected. They should not fear being fired. Nonprofits are hungry for charitable donations, but we as a sector must retain integrity. Nonprofit organizations should not allow improper behavior by donors or potential donors because they are desperate for funding. Of course, handling delicate situations diplomatically is essential. VIII. To be fully informed regarding who is responsible for securing donations, whether they be volunteers, fellow employees of the organization or hired solicitors. Nonprofit development staff may be assigned other tasks while volunteers and/or consultants assume the task of soliciting donations for special projects. A clear delineation of duties and assignments is essential. All must work together and avoid competing needlessly. Transparency across roles and teams is essential for the organization to succeed in its fundraising activities. Yes, I have witnessed nonprofit staff attempting to sabotage the work of well meaning fundraising consultants. The reasons for this are many, from personal jealousy to sincerely believing the reason for hiring a consultant was wrong. The potential for harmful interference must be anticipated and monitored. Reduce anxiety by making sure everyone on the team understands what is going on, and why. IX. To have the opportunity for their names to be deleted from mailing lists that an organization may intend to share. It is also true that the use of emailing platforms like Constant Contact, iContact, MailChimp, Emma and the like provide the opportunity for anyone on a mailing list to remove themselves immediately. This helps nonprofits comply with the federal CAN-SPAM Act. Knowledge of the Act should be standard for any nonprofit fundraiser. X. To feel free to ask questions when making a donation and to receive prompt, truthful and forthright answers. It goes without saying, to represent a nonprofit to the public and to respond to donor and potential donor inquiries, development staff must ask questions of fellow staff in order to fully understand the current status of activities that have been underwritten by donors. Nonprofit leaders should encourage those inquiries. My experience is the public is not aware that development staff are often as knowledgeable about the inner workings of their nonprofits as the director, senior program officers, and members of the Board. Anyone who researches and writes grants knows a comprehensive knowledge of the nonprofit is required to achieve success. Development staff are not just hired to be “nice” to donors and to organize parties. Their work is essential to the survival of the nonprofit, and to do it well requires in-depth knowledge and commitment. This article was originally a blog post published in 2014. I decided to update and make it available from my main menu. Advanced research can help prevent mistakes when approaching a foundation. It is also true that many donors (and their professional advisors) use GuideStar to review nonprofits for potential funding. Click to reach GuideStar. My discovery of GuideStar, and how it saved the day. Today, the first resource I consult when researching a potential donor is GuideStar. Surprised? Not only does GuideStar provide information about nonprofit organizations in the traditional sense, but you can also find information about donors like private foundations that are themselves nonprofit. There is an ocean of data about nonprofit donors on GuideStar! Among my favorite resources are the tax returns. Sometimes even the best online and printed foundation directories do not reveal the current state of a foundation. By reviewing their tax returns in GuideStar, you can discover who is currently serving on a foundation’s board of directors (and who is serving in what positions of leadership); you can find new contact information for the foundation (and sometimes, individual trustees); you can learn the latest projects funded (and sometimes foundations can change their funding focus areas without notice); you can discover the amounts of the grants awarded (thereby indicating the level of potential interest in your perhaps similar project); and more. Try the “advanced search” function on GuideStar, and you can discover such things as every museum in the state of Texas (and you can sort by budget size), or, every human services nonprofit in the state of Virginia, for instance. For me, the printed and online foundation directories are excellent resources for honing-down generally on prospective donors I want to research. But the truth is, the tax returns tell a more exact story about their current circumstances. There are other research resources that provide general assistance in this regard, among them The Foundation Center’s “Foundation Finder,” and the National Center for Charitable Statistics. I personally find GuideStar to be the most accessible, and I like the added benefits of its GuideStar Exchange Program, the GuideStar blogs, and the ability of individuals to review nonprofits via GreatNonprofits (your reviews are linked to the organization’s GuideStar profile). In fact, you can click on this link to find my “ongoing” GreatNonprofits reviews. But these are just the tip of the iceberg! I urge you to explore GuideStar’s website to discover all the helpful information and resources it provides. And my hearty thanks goes to GuideStar for featuring my two case studies. I hope you will take the time to read and enjoy them! As social media becomes more prominent, “online ambassadors” have become essential advocates. Earlier this year, Nielsen conducted a study to determine the types of advertising and promotion people trust most. Justin Ware summarizes key findings for Bentz Whaley Flessner in, “Nielsen Study Shows the Monumental Importance of Online Ambassadors” (January 23, 2013). Jenna Hanington has written for a corporate audience in Pardot, “The Importance of Customer Testimonials” (May 6, 2013). Click to read a fascinating study on Twitter use by Pew Internet Research Project (2012). Do you have an online ambassador program? My suggestion to nonprofit organizations is to include the role of “online ambassador” in the job descriptions for board and advisory board members who are active on social media. Can they set aside time once weekly, every few weeks, or monthly to share a positive experience, and to encourage their colleagues to support your nonprofit organization? This is a simple, but ultimately very helpful request to make. Certainly, you would expect leading volunteers and donors to be community advocates and to say positive things about your nonprofit’s work and accomplishments whenever and wherever appropriate. If your advocates are also active online, consider asking them to set aside time to share their opinions and experiences online. Ongoing identification of potential ambassadors for both awareness building and fundraising initiatives. Stewardship of those potential and approved ambassadors through good content and smart online conversation management. A plan for contacting potential ambassadors and officially bringing them into the program. A strategy for leveraging the support of your ambassadors. Geoff Livingston wrote a clever article for Razoo: Inspiring Generosity, “5 Ways to Engage Online Ambassadors” (October 20, 2011). Somewhat unusually, Geoff talks about using social media to inspire major gift prospects and donors. As I know first-hand from my volunteer work with NTEN: Nonprofit Technology Network, not everyone has understood that older generations – and those inclined to make major gifts – are also interested and involved in social media, not just the “general public” (see my blog articles, “Baby Boomers and Seniors are Embracing Digital Media” and “Americans and Their Gadgets”). Geoff provides a variety of creative ideas, from creating a social media advisory board to putting their names on a digital ambassador recognition “wall” on your website. Ask your donors and volunteers to “cheer lead” online for your nonprofit. Alexandra discusses the traits of four key social media “personas”: the Online Ambassador, Social Evangelist, Digital Strategist, and the Data Junkie. I certainly recognize some of my distinguished colleagues in Alexandra’s descriptions, but I had not thought about engaging them online in such insightful ways. As social media becomes increasingly influential and essential in our world today, don’t let the cart come before the horse, take the reins. Put social media to work for your organization! Nonprofit fundraising, digital communications and public relations | I abide by industry best practices (no percentage-based fundraising) | While based in Austin/Bee Cave, Texas USA, I work statewide and beyond | Use the secure contact form to reach me (email preferred) | Thank you! Sign up to receive occasional posts! This is separate from my quarterly e-newsletter (see the lower margin of this page). Learn more about Carolyn's iPhone landscape photos. Click to read my article, "Ethics and Philanthropy." Initial contact by email. Kindly use the secure contact form on this website. Meetings (including video calls), by appointment. 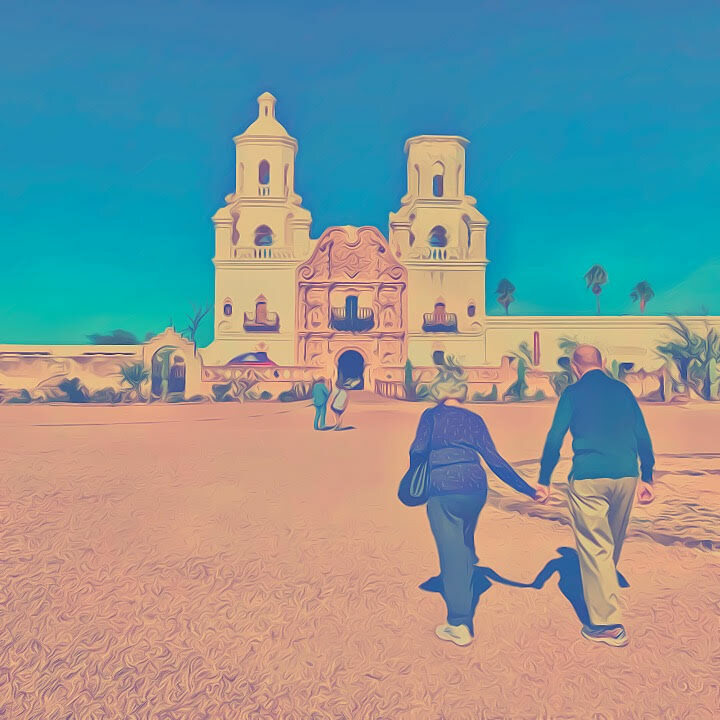 Shown at San Xavier Mission, Christmas 2018. This blog is written and designed by Carolyn M. Appleton. Carolyn is the sole author. All rights reserved. At this time, there are no guest authors. Having said that, Carolyn often shares links to other authors in her blog posts and primary articles.